NOTE: Updates are displayed before original post. Scroll down to 'Start of original post' to see original frame-by-frame analysis sourced from Officer Tensing's complete body cam recording. Update #12 contains review of Kroll Report; challenging the claim that Officer Ray Tensing provided an inaccurate statement as part of their investigation. Officer Ray Tensing may (jury will decide) have feared he was being dragged and thus feared for his life. The fear (from 1) may have justified use of lethal force (jury will decide). Not only may Officer Tensing have feared that he would be dragged, Officer Tensing WAS dragged as the video evidence conclusively shows (detail below). The jury will have to reconcile the fear of being dragged with the fact that he was dragged. The promised (see Update 11) complete review of the Kroll report is now available via Google Docs (link). The review details a major oversight in Kroll's analysis. "Contrary to Tensing’s statements, at no point in the body camera video footage does it appear that Tensing’s arm is lodged or caught in the steering wheel of the Accord or other aspect of the car’s interior." Porkopolis is reviewing the complete report in detail and will be publishing an analysis here in the coming days (see: 'Update 12'). Tensing’s decision to reach into the vehicle when Dubose started the car engine escalated and rendered unsafe what was, until then, a minor and uneventful traffic stop. According to Tensing’s statement to CPD two days after the incident, Tensing had “reached pretty far in” the car, “I would imagine two-and-a-half to three feet” when Dubose turned the ignition key. This led to additional actions by Dubose and Tensing that elevated the risk of a deadly encounter. While it is true that, had Dubose complied with Officer’s Tensing’s requests and not attempted to drive away, no shooting likely would have occurred, it is also true that, had Tensing exercised discretion and sound judgment consistent with his police training and generally accepted police practices, and de-escalated the encounter by allowing Dubose to simply drive off, his use of deadly force during this traffic stop would have been entirely avoidable. The report uses 7 pages (Section 3, pages 8 through 15) to detail and document policy and procedures, but does not reference a specific section of the police training manual to support the assertion. It is standard police practice, critical to officer safety, never to reach into an occupied vehicle during a traffic stop. It is taught as part of basic training in the police academy and is reinforced by FTOs on patrols with Officers-in-Training. Almost all of the UCPD officers interviewed by Kroll confirmed that they have been properly trained to not reach into a vehicle during a traffic stop. Many of these same officers cited the tragic line-of-duty death of CPD Officer Kevin Crayon on September 1, 2000. Officer Crayon was dragged to his death after reaching into a vehicle in an attempt to stop a 12-year-old driver from striking pedestrians and fleeing the scene. should emphasize the inherent dangers to officers, drivers, passengers, and innocent by-standers when an officer reaches inside an occupied motor vehicle during a traffic stop. If "Almost all of the UCPD officers interviewed by Kroll confirmed that they have been properly trained to not reach into a vehicle during a traffic stop" who were the officers that did not confirm that they have been "properly trained to not reach into a vehicle during a traffic stop" ? Does this list of officer(s) include individual(s) beside Officer Ray Tensing? If the report states the standard police practice is to "never reach into an occupied vehicle during a traffic stop" why is it necessary to "create an In-Service Training Module" to "emphasize the inherent dangers to officers, drivers, passengers, and innocent by-standers when an officer reaches inside an occupied motor vehicle during a traffic stop"? Does the existing training module already state that an officer should "never...reach into an occupied vehicle during a traffic stop" and if it does, why wasn't it referenced in the report? Why is Kroll recommending that officers be educated on the dangers "when an officer reaches inside an occupied motor vehicle during a traffic stop"; implying that there are some circumstances when an officer may reach inside a car? If the rule and policy is "never to reach into an occupied vehicle during a traffic stop" is it necessary to educate officers on the dangers of what happens when they are doing something they shouldn't be doing in the first place? ...Police officials aren’t saying why the officer, who has been on the force for more than six years, reached into the Prius. But law enforcement officers say it isn’t a step taken lightly. “We definitely don’t want to go in through an open window,” Kansas Highway Patrol Trooper Chad Crittenden said. Link to analysis by David Blake, a certified police instructor: Ray Tensing Shooting: Potential Video Bias. "The State is unaware of evidence favorable to the Defendant." They haven't looked or are purposefully avoiding the evidence. Reporter: Let's start with Ray Tensing. It's been almost two weeks since you indicted him. Deters (interrupting): I didn't, the grand jury did. ...Police Officer Ray Tensing was hired to patrol the CUF area for the drug dealers, burglars and violent people who have plagued that community for decades. We can assume that he sensed DuBose was one of these. A police officer has to have a pretext to stop and talk to suspected criminals. Tensing found one – the car had only one license plate. Tensing didn't know it at the time, but he was right! DuBose's records show that he was a drug dealer, burglar and violent person – just what Tensing was hired to look for. He was also illegally driving the car, illegally had drugs for sale, and obviously lying to Tensing at the traffic stop. In the next few seconds, both made some bad decisions. DuBose illegally failed to comply with Tensing's orders, illegally resisted arrest, and illegally drove off. Tensing reached into the car. DuBose sped up regardless of the danger to Tensing. Both would probably tell you these were the dumbest things either had done in their lives. But only DuBose's actions had criminal intent. ...Q: The officer's attorney told us that the officer was dragged. And the incident report suggests that, too. Does the video show that at all? Deters: No, he wasn't dragged. Q: Was he ever knocked to the ground, from the hood of the car to the ground? Assuming a formal forensic analysis (as called for below) establishes that the Mr. DuBose's car was moving (as CNN reports; see Update 2) while Officer Tensing was holding on to the seat belt (see: Time Mark: 3:16 below), the jury will have an opportunity to assess Tensing's state of mind and the accuracy of his statements to Officer Weibel. At a minimum, Tensing's defense team may use this as evidence to argue reasonable doubt. To support the 'state of mind' argument, Officer Tensing is heard in the video yelling "Stop, Stop". Consider this: does someone yell "Stop!, Stop!" to something that's already stopped or something that is moving and they want to get it to stop? Will it be forensically established, beyond a reasonable doubt, that the car was moving before Officer Tensing used his gun. If (1) is established, did Officer Tensing, who was holding the seat belt (as established by Time Mark 3:16 below) while the car was moving, have a reasonable fear in his mind that he was being dragged; resulting in the use of his firearm to defend himself. CNN does not analyze the oil stains evidence, as is done below, to show that Officer Tensing was indeed dragged. On July 29, 2015, Officer Ray Tensing was charged with murder in the July 19, 2015 death of a Sam DuBose. ...But [Prosecutor] Deters said Wednesday that the video doesn't support that telling of events. Rather than being dragged by the moving car, Deters said, Tensing "fell backward after he shot [DuBose] in the head." The video does appear to support Deters' account that Tensing fell backwards after firing the shot. In the video, Tensing repeatedly asks DuBose if he has a license. DuBose says he has one and it's not suspended, but he doesn't have it on him. Tensing then asks DuBose to take his seat belt off. 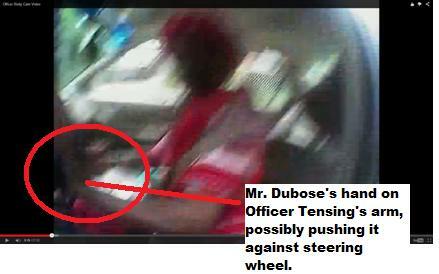 At that point, DuBose appears to put his right hand on the key in the ignition, and it sounds as if his car is starting. Tensing screams, "Stop! Stop!" before firing his gun at DuBose. The following type of analysis and evidence from Officer Tensing's body cam will more than likely be part of the trial and search for justice; for Mr. DuBose, Officer Tensing and the whole Cincinnati community. Both the death of a fellow citizen and the prosecution of an officer sworn to protect us is a serious matter worthy of thoughtful and fair assessment. This initial analysis of the video challenges the reported assertion that "Rather than being dragged by the moving car, Deters said, Tensing "fell backward after he shot [DuBose] in the head." In addition, the analysis points the way to determine if there is "clear indication that Tensing was dragged ﻿before ﻿he shot DuBose". The analysis shows that an angle made by a line from the license plate of an automobile parked in a driveway to the passenger-side door-release knob becomes more obtuse (gets larger) from the time the car is turned on by Mr. DuBose to the time Officer Tensing fires his gun. Note: A formal forensic analysis that accurately accounts for the relative positioning of items noted in this analysis and for the possible body cam fish-eye-like distortion would be required for a definitive conclusion. Ultimately, a jury of his peers will determine if Officer Tensing properly feared for his life during the incident, but the jury should have all the facts when an officer's liberty is at stake and a fellow citizen is dead as a result of his actions. Mr. DuBose's is the passenger in the dark car on the far right of the frame. There is no car parked along the fence. Seven (7) vertical steel fence beams down along the fence is a large pole (see red arrow) which will be referred to later. A small oil stain is located near the driver-side, front wheel of Mr. DuBose's car. Two large oil stains are located several feet down the road in front of Mr. DuBose's car. Evidence/Analysis: Two video frames; one unaltered; the second with a red line from the center of the parked automobile in the driveway to the door release knob in Mr. Dubose's car. Evidence/Analysis: Two video frames; one unaltered; the second with a red line from the center of the automobile parked in the driveway to the door release knob in Mr. DuBose's car. The approximate angle made by the red lines is 110 degrees. The 3:15 video mark is approximately 1 second after Mr. Dubose has turned on the car. Take careful note of how much of the automobile is visible in the area that frames the passenger-side window. Evidence/Analysis: Two video frames; one unaltered; the second with two red lines that make an angle of approximately 115 degrees. Note that more of the automobile in the driveway can now be seen within the frame around the passenger-side window. or any combination of all three dynamics. Officer Tensing is clearly grabbing Mr. DuBose's seat belt. Time Mark: 3:17 The moment Mr. DuBose is shot. Evidence/Analysis: Two video frames; one unaltered; the second with two red lines that make an angle of approximately 145 degrees. Note that the automobile in the driveway can now be completely seen within the frame around the passenger-side window. The angle made by the red lines has grown from 110 degrees to 145 degrees suggesting that the car has moved. This possible movement of the car, while Officer Tensing was holding the seat belt, is probably what Officer Tensing reported as being dragged. Evidence/Analysis: Officer Tensing and the body camera are now facing the fence beyond the the pole identified in initial frame at video time mark 1:15. Officer Tensing is on the ground. Two video frames; one unaltered; the second with red arrows identifying the pole and a passenger car that may have an additional witness to the incident since that car was not there when the stop was initiated. Note that it looks like the brake lights on the car are on. Time Mark: 3:22 Officer Tensing is lifting himself from the ground. Evidence/Analysis: Two video frames; one unaltered; the second with red arrows identifying the oil marks from video frame above at 1:25. This is conclusive evidence that Prosecutor Deters' assertion that "Rather than being dragged by the moving car, Deters said, Tensing "fell backward after he shot [DuBose] in the head." is incorrect. The evidence clearly shows that Officer Tensing was dragged from the location where Mr. DuBose's car was at 1:25 in the video (shown again below for reference) to where Officer Tensing is at 3:22 in the video.